When I saw these pop up on Food In Jars' Facebook page a couple weeks ago, I knew that I would be making them. 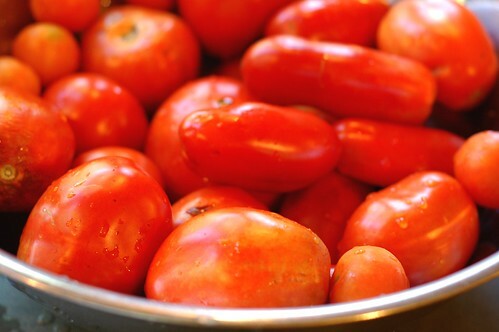 They are the most delicious thangs -- sweet, chewy, and intensely tomato-ey (it's my blog so I can make up any words I feel like.) 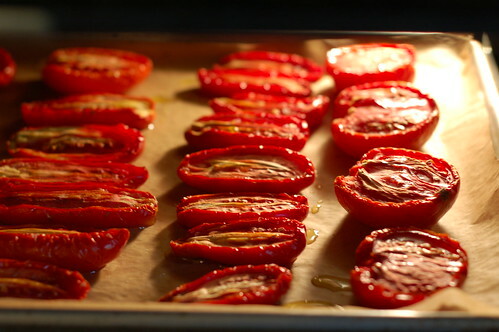 The long roasting concentrates a whole tomato's worth of flavor into the delightfully shriveled, slightly gooey treat that remains at the end of 10-12 hours in the oven. While not exactly quick, they are sublimely easy to make. 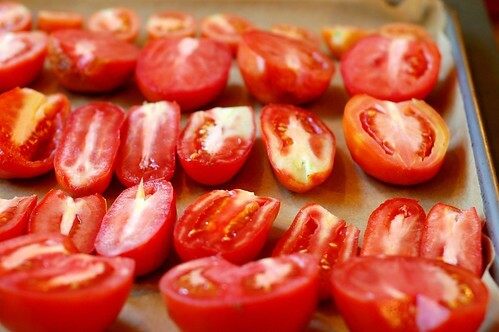 All you do is preheat your oven to 200 F. While you're waiting, wash the tomatoes. Slice them in half (or into quarters if you're using a rounder, fatter variety) and lay them in a single layer on parchment covered baking sheets. When they're done, let them cool down. 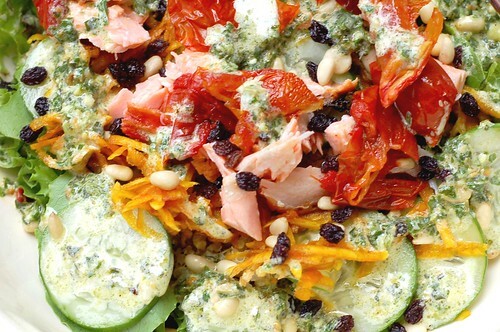 Remove however many you plan to scarf down in the next week and put them in an airtight container with a lid. 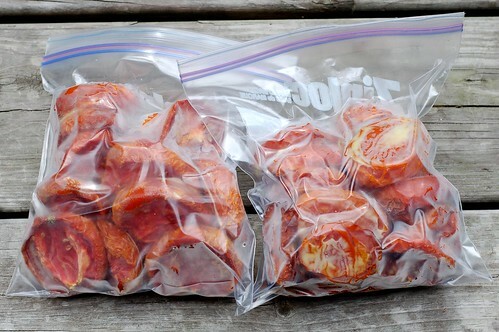 Then freeze the rest on their sheets, pack them into glass jars or freezer bags and toss them into the freezer. An excellent solution for fitting more tomatoes into my cramped freezer. A busy work schedule means that I've been freezing more than canning lately, and whole, uncooked (expect for removing skins) tomatoes take up lots of precious space. I let them go till they are almost dried and then pack them in olive oil and refrigerate. they keep for months this way and you also get a nicely flavored oil. 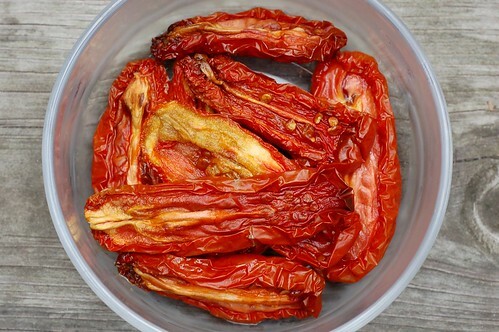 I love shriveled oven-baked (sundried) tomatoes. Just wondering, you said to bake it for 12 hours? does this not over heat the oven? I have an electric oven, can I do the same with mine? nope, it does not get too hot because you're cooking them at a very low temp - just 200 degrees. I would think it would work just as well in an electric oven as in a gas-powered one so give it a try! 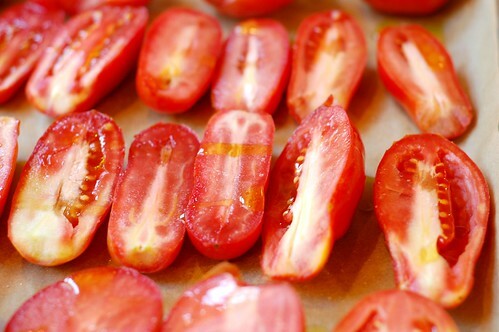 Or, if it seems daunting, try it for the first time with those little grape tomatoes since they'll only take 6-8 hours at 200 degrees. Slow, I mean so good! I only made 2 lbs, and they never made it into the freezer! THanks so much for sharing, look for a post where I use them, cannelini bean crostini with magic herb sauce, posting in a few days. Hope you're well! I will definitely keep an eye out for that post - the crostini sound great! 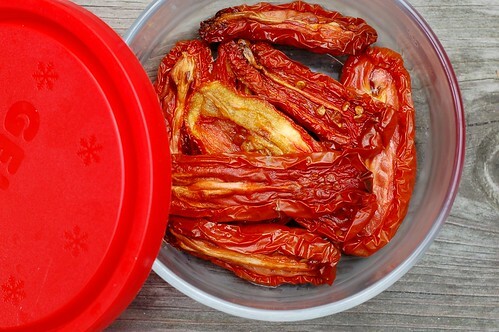 This is such a great way to save tomatoes. Thanks for sharing. I miss garden tomatoes in the winter. I am going to try this.